If you want to listen to the review, check out my video below. There are many reasons why I picked this quote but put simply its because it just fits Clannad well. Clannad isn’t your run of the mill slice of life drama anime. It’s much more than that, I’ll be going more into detail about it later. Let’s start with some general information. Clannad is a Slice of Life, comedy, and romantic anime. It was first aired on Oct 5, 2007, and last aired on Mar 28, 2008. There are 4 producers (Pony Canyon, TBS, Movic, Animation Do), 1 licensor (Sentai Filmworks), and one studio (Kyoto Animation). More importantly, the original creator was Visual Art’s/Key. Key was the original creator of around 7 different series, including manga. Clannad had a total of 23 episodes, 2 of which were OVA’s. Each episode is 24 minutes long, meaning it would take around 9 hours to complete the anime. Clannad: After Story was first aired on Oct 3, 2008, and last aired on Mar 27, 2009. It has a total of 25 episodes and 24 minutes long. There wasn’t much change to the staff, but there were slight additions/removals. but later on realizes that the club has disbanded. Throughout the anime, Tomoya and Nagisa make it their goal to get the Drama Club back together again. Along the way, they meet many other characters that help and contribute to the overall season. Clannad: After Story is different to Clannad. Clannad: After Story is after Tomoya and most of his friends finish high school and move onto college. They all ultimately disband, except for Tomoya and Nagisa who chose to stay regardless of Tomoya's feelings about the town. Throughout the show, Tomoya learns the hard truth about life, and that life is filled with difficulties, but it’s better to be with the ones you love and care for than to be alone. Clannad’s story isn’t an original one. There are millions of high school anime everywhere. Romance is also overused in the anime scene. However, there are some inclusions that this anime has that many others don’t. As an example, throughout Clannad and After Story, there are parts in the episodes where there are a girl and a robot. The girl is in the Illusionary World, a land where “nothing can be born.” She creates a doll made out of garbage that somehow gains life. The doll convinces the girl to leave the world and they try to create a flying machine. It’s a side plot that goes into the main plot well, and at the same time, it does so in a secret fashion. It creates many theories that make the series even better and have you interested in the what if’s. Clannad: After Story is probably the best season out of the two, it also happens to be a pretty sentimental one. Tomoya is a lot more serious in this season, this is expected since he is an adult at this point. The season also has many themes behind it that can be applied to real life. It’s also a good example of a Slice of Life since it often focuses on the day to day life of an adult. Clannad: After Story is a very sentimental season for many reasons related to loss. Like I previously mentioned, Tomoya Okazaki is a student at Hikarizaka Private High School. He hated his school and town and would slack off a lot. Then he met Nagisa Furukawa, which changed his life for the better as seen throughout the anime. He slightly changes from Clannad into After Story as seen from his attitude. He became a lot more serious, which restricted the number of jokes made in Clannad: After Story. Nagisa Furukawa is also a student at Hikarizaka Private High School. She is a shy girl and is also the main female protagonist. She is also self-deprecating; she doesn’t care for herself and only for others. She has a great personality for an anime like Clannad as she helps Tomoya in the anime. Youhei Sunohara is a Hikarizaka Private High School student and is friends with Tomoya. He is similar to Tomoya with his school habits, but he is very clumsy. After Tomoya met Nagisa, Tomoya rarely hung out with Sunohara. He was serious in some episodes, but overall he was clumsy and was the character that gave the jokes/punchlines. This anime really unpacked the characters well. Each character was apart of their own side-plot/arks even if they weren’t important. It gave the audience more of an understanding of the characters within it. For example, a character that was partly in the anime to help Tomoya with his relationship with Nagisa, Yukine, has her own side-plot in After Story. This side-plot ended really well and I’m glad they did it. The humor is decent. Like I said before, there isn’t any humor in After Story, so I can’t give a rating for it. However, Clannad has plenty of them. Are they good? Eh. In my Overlord II review, I mentioned that you should never repeat the same joke over and over again. This includes Clannad, as well. A supporting character in the anime, Tomoyo Sakagami, is apart of a running gag in the anime with Sunohara. In one episode, Tomoya and many other students see that there are some bullies with motorcycles outside. Tomoyo makes them leave by fighting them, and Sunohara believes that she faked it. So in almost every episode, he challenges her to a fight, and obviously, he always loses. Jealousy. Oh, jealousy. Something that is used in many romantic shows. This anime doesn’t have a lot of it, but it is there. Another 2 supporting characters, Ryou Fujibayashi and Kyou Fujibayashi, are both sisters. Kyou mentions to Tomoya that he’s spent a lot of time with Nagisa and should spend time with her and Ryou.~! She knew that Ryou had a crush on Tomoya so she helped her eat with him. She herself had a crush on him as well. There’s a reason why this anime is in the romance genre. It’s also the reason why it’s in the drama genre. Yeah, you guessed right, it’s because there’s a surprising amount of romance. Excluding Youhei (self-explanatory), Tomoya is the only male main character that has other characters loving him. To name most of them, Nagisa, Ryou, Kyou, Kotomi, Tomoyo, Yukine, and Fuko (Fuko and Yukine show a relationship to Tomoya in the Visual Novel). Basically, every female high school supporting character loves him. In the General Information part of this review, I mentioned how there are some OVA’s in both seasons. Let’s talk about them. Clannad’s “Another World: Tomoyo Chapter” is an OVA that like the name suggests is an episode with an alternate timeline. It goes with the plot that Tomoya and Tomoyo are dating and she becomes student council president. Tomoya stops dating her after he feels that he’s an inconvenience to her. Tomoyo becomes very popular and accomplished and towards the end, they date each other again because she wants to be with him again. It’s a decent episode, but it isn’t that original. But hey, what do you expect, most things aren’t original. Tomoya actually starts going to school on time after dating Tomoyo, which means she helped him with going to school, similar to how Nagisa helped Tomoya be calmer. Oh yeah, did I mention that some moments in Clannad, especially this OVA, is cringy and hard to watch because of the relationships in them. There isn’t much that I can say that hasn’t been previously said. Is it a good example of what the anime is about? No. However, it still is a good episode to watch. It’s sentimental towards the end. The audio in the anime is great. There are no audio errors (or any obvious ones). The voice actors do their job really well of conveying the character. Onto the opening theme and ending theme, they are also great. The opening theme of both seasons is your run-on-the-mill drama-filled and romantic Japanese opening. The ending theme for Clannad is one of the best ending themes I’ve probably ever seen. It’s cute, it’s relevant to the anime, and it really is good overall. “Dango Daikazoku” (Great Dango Family) is a song about Dangos, a food/character in the anime. Something awesome about the song is that dango is real food, which is dumplings. The song is very upbeat and happy as well as relate to the anime. Unfortunately, the entire ending theme changed to your run-on-the-mill drama-filled and romantic Japanese ending in S2. The animation is great. Since this anime started in 2007, this anime has the same art style an old anime would, like DBZ. The art style also looks like a drama/romance type anime, so it doesn’t have its own, unique art style. In fact, Kyoto Animation is the mastermind behind the animation production. Shows like Air, Kanon, and Clannad (All Visual Art’s/Key anime) have similar a similar art style as Kyoto Animation is the animation production. However, Kyoto doesn’t only have this art style. They were also apart of many other animes like Lucky Star, Miss Kobayashi’s Dragon Maid, A Silent Voice, K-On, and a few others. If you compare these anime’s animations to an anime like Clannad, it’s pretty evident that they are different. I think that it’s pretty cool that they have different types of animation. I know that for myself whenever I finish an anime, I would want to read the manga, to see if it has anything that wasn’t shown in the anime. Most animes use the manga itself to guide itself all the way to the end, however. This anime does that, mainly because they were both created by Visual Art’s/Key. The anime doesn’t use the order that the manga uses for the side plots, and it’s confusing. Also, the manga hasn’t finished the translation, so you just halt entirely, and it doesn’t look like any of the other volumes will be translated soon. Before giving my final review, I want to talk about the merchandising. As I mentioned before, you shouldn’t buy the manga unless you want to experience the show again and you know Japanese. On iTunes, The OST of Clannad is $16 (0.99 per song) and you get 56 songs. Is it worth it? Yeah, the songs are sentimental and overall are pretty good. Now the star of this section, the visual novel. Clannad is on Steam, PS4, and a few others. This is basically DDLC but unironically. It’s $50 so it’s almost full price. I personally wouldn’t buy it as it doesn’t look very good from the pictures. If you are a die-hard fan of the series and want more, however, you could get this. It might not meet your expectations. Clannad was the first anime I fully watched after my long anime hiatus, and it was a good anime to start off with. Yes, it did end 9 years ago, but with a large amount of anime, there are many that are just looked over and forgotten about. This anime is a pretty good one as well as one that I would recommend. To end off this review, I would like to give this anime my rating. Even though there are some things that aren’t good about the anime, it still is good and deserves an 8/10. Clannad: After Story is a very sentimental anime that teaches the theme of life, which is why it gets an 8.63/10. Overall, the series gets an 8.31/10. Here is a table of my review. 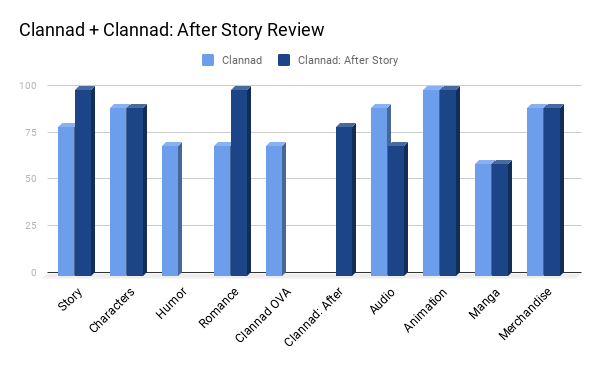 Thanks for reading my review on Clannad + Clannad: After Story! I hope you enjoyed.